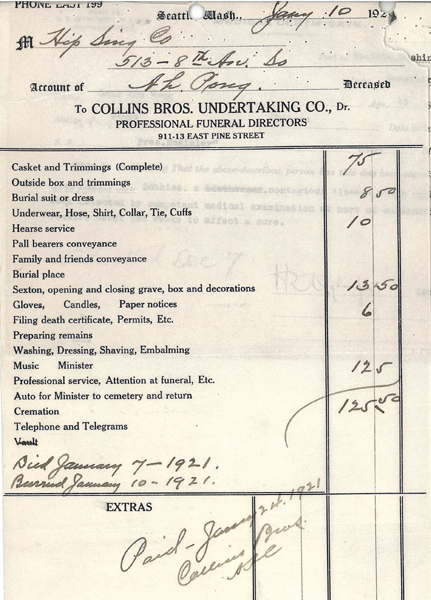 “Undertaker’s Bill for Look Ah Pong,” 1921, Chinese Exclusion Act case files, RG 85, National Archives-Seattle, Look Gom Hong case file, Seattle Box 650, 7030/7291. Look Ah Pong, an American-born Chinese citizen died on 7 January 1921 and was buried at Mount Pleasant Cemetery, Seattle, Washington on 10 January. His son, Look Gom Hong, born at Sing Shu Village, Fook Chung, Sun Ning, China, originally entered the United States through the Port of Seattle in 1923. He received his Certificate of Identity #50610 upon arrival. After his entry was approved he joined his older brother, Look Gim Yook (York), in New York City. In 1935 Look Gom Hong filled out his Form 430, Application for Pre-investigation of Status, for his upcoming trip to China. He was 25 years old and a waiter at Li Chee Gardens Restaurant in New York City. In over five pages of interrogation Look Gom Hong described his father’s and mother’s siblings, his grandparents on both sides of the family, their extended families, and many details about their village. The Inspectors reviewed the interrogations and decided that the testimony of the three witnesses agreed. Look Gom Hong made a favorable impression; the brothers resembled each other and they were prompt and frank in their testimony. Look Gom Hong’s application was approved. “Photos of Look Kim York and Look Gom Hong, Affidavit,” 1923, Chinese Exclusion Act case files, RG 85, National Archives-Seattle, Look Gom Hong case file, Seattle Box 650, 7030/7291. Admittance application for Helen Lew, No. 165/15/-10, 1923, Chinese Exclusion Act case files, RG 85, National Archives-Seattle, Helen Lew, Box 812, Case 7030/13122. 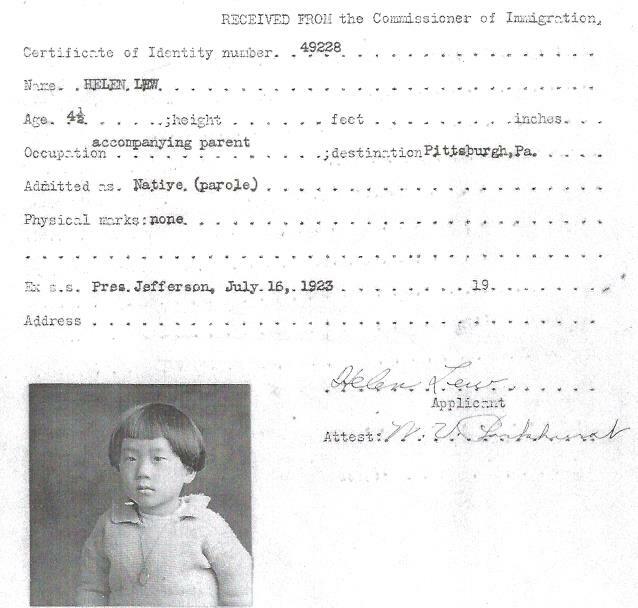 Helen Low, age 4-1/2, arrived on the SS President Jefferson on 16 July 1923 and was accompanied by her mother Virginia Lew. Their destination was Pittsburgh, PA. 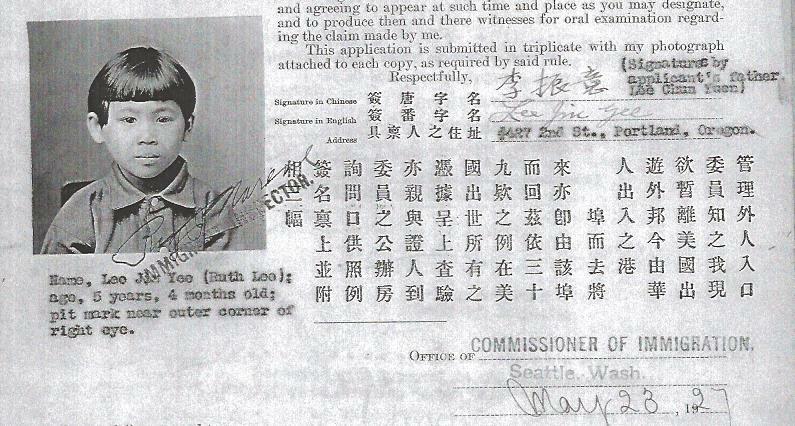 This file also contains Helen’s 1918 Ohio birth certificate and lists her parents as Mary Chan and Lew Ling Chong. A 1921 photo shows Virginia Lew holding Helen and another younger child. 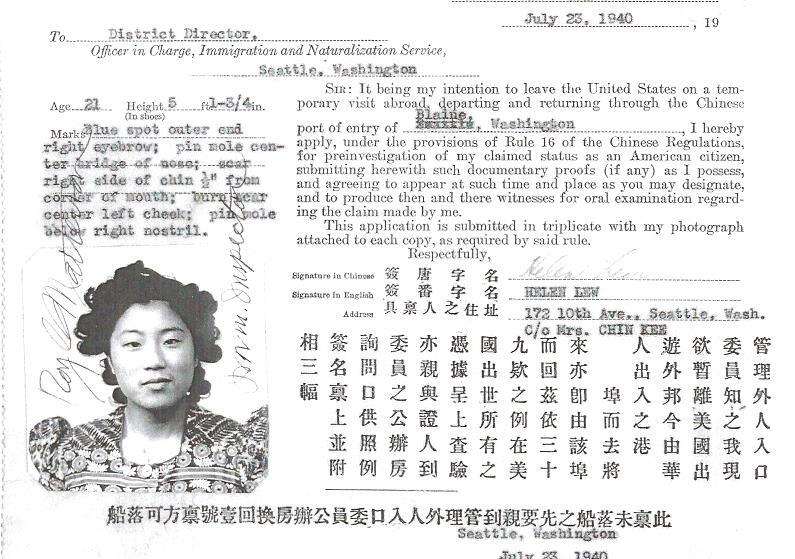 Form 430 for Helen Lew, 1940, Chinese Exclusion Act case files, RG 85, National Archives-Seattle, Helen Lew, Box 812, Case 7030/13122. In 1940 Helen Low, age 21, was applying to leave the United States via auto through Blaine, Washington. She needed to obtain permission from the Canadian authorities before entering Canada. She gave her address as 172 10th Avenue, Seattle, WA, in care of Mrs. Chin Kee. Lee Jin Yee, Preinvestigation form, 23 May 1927; Chinese Exclusion Act case files, RG 85, National Archives-Seattle, Portland Case 5017/404. Lee Jin Yee (Ruth Lee) age 5 years, 4 months old; The application was signed by her father, Lee Chun Yuen. They were living at 4427 2nd St., Portland, Oregon. Lee Jin Yee, Reference Sheet, 1927; Chinese Exclusion Act case files, RG 85, National Archives-Seattle, Portland Case 5017/404. Many case files include a reference sheet but they usually are not as extensive as this one. Lee Jin Yee’s father, two brothers, and three sisters are listed with their case file numbers. A search can be made for these files for more family information.